Usually intensive ultrasound is transmitted into small volumes via a titanium sonotrode immersed into the liquid. This method is very efficient but has the side effect that there is also cavitation at the sonotrode, which results in a small contamination with fine titanium particles into the medium. Such additions have to be avoided if a high degree of purity is demanded as for example in the pharmaceutical industry. In order to solve this problem Hielscher Ultrasonics has developed in co-operation with the ETH Zürich a special flow cell, that sonicates a medium indirectly but nevertheless with a very high intensity. In a closed system the medium is led contamination-free through a glass tube, having no contact with the sonotrode or with the atmosphere. A liquid surrounding the glass pipe supplies the right process temperature. This method guarantees a high reproducibility. 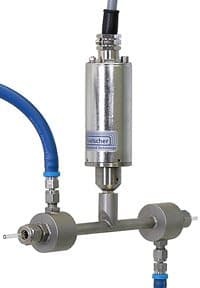 In combination with a special designed ultrasonic processor UIS250Dmini this flow cell can be used in particular for homogenizing, emulsifying, dispersing, deagglomerating or for the disintegrating of biological cells or micro organisms. The flow cell is suited for applications in the laboratories as well as for productions of small amounts and of course the same principle can also be realized in a larger scale. Please use the form below, if you wish to request additional information regarding this ultrasonic device.